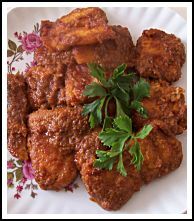 Balinese Spiced Fish or Ikan Bumbu Bali in Indonesian is a very popular fish recipe and it's not only for local people, also outside Indonesia, this fried fish with special spice is also loved by many people. As you have already known that Bali is very popular with their seafood, so this fish recipe is also one of their famous recipe. It's worth of try to taste this delicious fish. And at the same time you get health and nutritious food. Make a smooth paste of shallots, garlic, red chilies, candlenuts, and ginger. You can use Mortar and Pestle in traditional way or use food processor, which is the easiest and the fastest way. After the paste completely smooth, add tamarind water, some sugar and salt. Set aside. Heat the oil and bake the fish, and fry it until it has golden brown color. Remove and set aside. Heat 2 tablespoon oil in the pan, and add the paste and lemon grass stalk. Fry it until fragrant. Add some water. Let it boil. Add the fried fish and sweet soya sauce and stir it until the sauce has thickened and becomes oily.